After Marvel’s release of Avengers: Age of Ultron, you can forgive a lot of movie fans that looked at Ant-Man, the movie to kick off Phase Three, as a film that’s easily forgettable or one to be cautious about. Much in the same way as last summer’s Guardians of the Galaxy, the movie turns out to be a surprisingly good one, with Marvel churning out yet another solid, action-packed movie. The charming story of Scott Lang (Paul Rudd), a thief who after serving time in jail is simply seeking to become a decent guy to live up to his daughter Cassie’s vision of him, soon finds himself becoming a protégé of sorts to Hank Pym (Michael Douglas) and his daughter Hope (Evangeline Lily) as they attempt to break into their own company in order to stop some of their technology getting into the hands of evil genius Darren Cross (Corey Stoll). The script is very much structured to introduce filmgoers to this universe, but thanks to where it is placed in the Marvel Canon, it’s allowed to spread its wings, with namedrops of the Avengers, the base we saw at the end of Ultron, and the appearance of The Falcon (Anthony Mackie). This in turn, pushes the movie up so it doesn’t just feel like a Phase One movie. Rudd, Douglas and Lily have a great chemistry and on-screen presence together, but its Michael Peña’s Louis that steals the show; literally every scene he is in has audiences eating out the palm of his hand. Whilst the character of Scott Lang doesn’t completely capture our hearts like Pratt’s Star Lord in Guardians, it goes as far as it needs for the film to be a success. By the end of the film, moviegoers are looking for the next appearance of Ant-Man, and with the two credit scenes (stay right to the end folks), it very much looks like we won’t be waiting long. A film that’s proof that you don’t need to be the biggest hero on the block to be a success, and also proof that whatever Marvel touches, will never let you down. 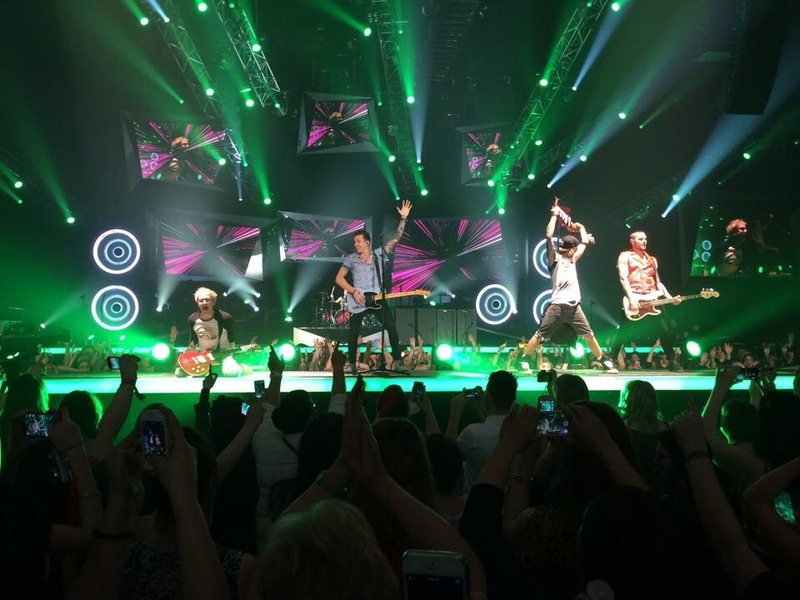 Back in April, one of my good friends asked if I wanted to go see McBusted with her last minute -she’d found seats and couldn’t resist going again (she went on to see them 3 time more.) It took me all about 10 seconds for me to say yes. I’m 23 years old, and while I haven’t been a huge fan of McFly, I was still a fan, and the added factor of having Matt Willis and James Bourne join the band from Busted, who I loved when I was in my early teens convinced me that it was an opportunity I couldn’t pass up. The seats turned out to be extremely good ones; we were only 5 rows from the front and I had one of the best times at a gig. The guys were energetic, fun and put on a brilliant show which left me with a huge smile on my face. When same said friend asked me over the weekend if I wanted to come see the tour film with her, I again couldn’t resist relieving the whole experience again. The movie revisited all the same songs I loved on the evening, offering footage from O2 Arena in London and also their show in the summer at Hyde Park, whilst also providing some candid backstage footage and interviews with all the band. Whilst watching the film, surrounded by dare I say, a lot of people/girls that were younger than me, I suddenly had those same emotions and feelings that I did on that night back in April -an overwhelming feeling of being happy. These 6 guys are incredibly infectious to watch -they may all be in their early 30’s with many in committed relationships or married, but their behaviour is a lot like children. They run round a brilliant set, jump, and sing their way through the McFly and Busted back catalogue, singing fan favourites such as “Year 3000”, “Crashed the Wedding”, “Five Colours in her Hair”, and “Obviously”. They looked like they were having a blast when I saw them live, and this film proved that -I lost count of the amount of times each of them said how blessed they felt to be given this opportunity, and how much fun they were having. This was particularly shown by the Busted boys, who thought they would never get the chance to sing these songs again after the band split up back in 2005. While the show didn’t show much of each members personal life, the film was very much about the band, and truly showed how well they all connect and get on. The chemistry shone on screen and it really plastered a smile on my face to watch their interactions and band rituals, particularly the clap. This involved all the band standing in a semi-circle before going on, following one members lead and clapping once so that it makes one sound. Each take they used in the film, the boys got it in one. For anyone that was or is a fan of McFly, Busted or McBusted, then this is a film for you. Even if you didn’t get to see the tour, you can experience the excitement and the fun that they created every night on-screen, and if you were lucky enough to see it, like me, then relieve it all over again. I promise it’s worth it.